Civil rights leaders and members of Congress praised the dismissal of Chief Strategist Steve Bannon from the White House; Bannon’s exit is just the latest departure from the chaotic Trump Administration, that has yet to win a major legislative victory. Bannon seemed to be in good spirits after the White House announced that he would be leaving the coveted post. He also told the magazine that he could be more effective without the constraints of the White House. In a statement about Bannon’s dismissal, Congressional Black Caucus Chairman Cedric Richmond (D-La.) said that Bannon needed to go, but so do other White supremacists working in the Trump Administration. In a separate statement on Bannon’s removal, House Judiciary Committee Ranking Member John Conyers, Jr. (D-Mich.) called the ousted Breitbart chief the standard-bearer for the worst instincts in American society. “Whether Bannon personally trades in violence, racism, and bigotry, he allowed Brietbart, his media organization, to become a platform for White nationalism, misogyny, anti-Semitism, and anti-immigrant sentiment of the worst kind,” said Conyers. Although Conyers said that he was pleased that Bannon was no longer serving in the White House, he added that Bannon’s removal will not undo the damage that has already been done and it will not reconcile the hate-filled agenda of the Trump Administration. Civil rights leaders also voiced their support of Bannon’s exit. 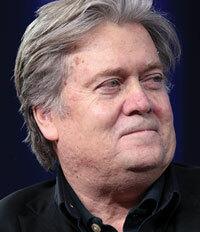 Kristen Clarke, the president and executive director of the Lawyers’ Committee for Civil Rights Under Law said that Bannon was the driving force behind the racial turmoil that threatens to tear this country apart. “Such a divisive figure has no place in the White House,” Clarke said in the statement. Vanita Gupta, the president and CEO of The Leadership Conference on Civil and Human Rights, said that Bannon’s departure was the right result, but not for the right reason. White House insiders have claimed that Bannon submitted his resignation letter earlier this month, but the announcement was delayed, because of the violent White supremacists’ rally in Charlottesville, Va., that left one dead and 19 injured. Since July 21, four senior staffers have departed the White House; Press Secretary Sean Spicer, Chief of Staff Reince Preibus, and Communications Director Anthony Scaramucci. Derrick Johnson, the interim president and CEO of the NAACP, said that the group was glad to see Bannon out of the White House. “Ousting one key staffer, however, can’t erase the words used by President Trump this week in defense of domestic terrorists, neo-Nazis and White supremacists,” said Johnson, in the statement about Bannon’s dismissal. “President Trump provided permission for these hate groups to exist. Following the tragedy in Charlottesville, Virginia, numerous other rallies and White supremacist groups are being mobilized across the country.